ALEXA VON TOBEL, CFP® is the founder and CEO of www.LearnVest.com, an award-winning financial planning site. A Certified Financial Planner™ who attended Harvard Business School, Alexa has been featured as a financial expert in the Wall Street Journal, the New York Times, BusinessWeek, Fast Company, Forbes, InStyle, Glamour and on the Today show, Good Morning America, Anderson, Katie, ABC News, Bloomberg News, and more. Her speaking engagements include Maria Shriver's Women's Conference, SXSW, Fortune Most Powerful Women's Conference, and TEDxWallStreet, and she is a columnist for Cosmopolitan, Inc. Magazine, and Ladies Home Journal. 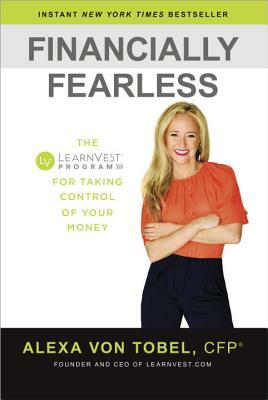 "Geared to help the financially complacent and those who need a push to face their finances...[Financially Fearless] delivers sound suggestions in an easy-to-digest package." "Von Tobel believes that financial planning shouldn't a luxury. She has the ability to share spot-on advice with people across the country and give everyone the ability to join the movement." "If you’re the type of person who’d never be caught dead buying a book on personal finance, pick this up right now. As fearless as the name suggests, von Tobel is a fresh face of a new generation. "Von Tobel's mission to help Americans become Financially Fearless is so important. She's so on point with the information and empowerment people need where their finances are concerned." "What I love about this book is how von Tobel guides you, clearly and honestly, to improve your finances while still living your richest, most satisfying life. Getting in financial shape doesn’t have to be painful—Financially Fearless proves that, once and for all."